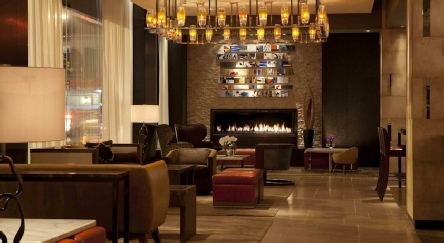 This New York Intercontinental is one block from Times Square and less than one mile from Central Park. Port Authority Metro Station is just 3 minutes’ walk away. Intercontinental New York Times Square offers spacious rooms with well-lit work desk and sofa bed. Each unit is equipped with a satellite flat-screen TV, coffeemaker and minibar. The modern bathroom includes a hairdryer. The hotel’s Marketplace offers meals on-the-go, including pastries, snacks and coffee. Ca Va Brasserie reflects New York City’s dynamic and international culinary scene, serving seasonal French inspired cuisine. The restaurant offers guests a variety of unique options, from the relaxing ambiance of Ca Va's Fireside lounge offering specialty cocktails, to the more formal and intimate main dining room where guests can enjoy breakfast, lunch, or dinner. This Intercontinental offers a 24-hour gym for those wanting to maintain their work out routine. Located on the third floor with views over 44th street, it features Stairmasters, lifecycles and treadmills. Free weights are also available. Towering 36 stories above the city, Intercontinental Times Square provides guests with front row seats to New York’s impressive skyline and Hudson River. It is situated in the Broadway Theater District. 2019 package holidays to the InterContinental Times Square, New York Prices are per person based on two sharing, including flights and accommodation (plus transfers in Caribbean destinations), and are subject to availability. Flights from Heathrow - other departures also available, call for details.